This post is sponsored by Onanoff. We are music lovers and fans of all things related to technology at our house. Surprisingly we haven't had any kid headphones in our house until this year. For some reason I thought it was totally OK for the kids to watch a movie on an airplane flight WITHOUT sound. They just recently started protesting, so we had to start researching headphones. Today I am excited to share a bit about BuddyPhones from Onanoff and why we like them. I also have a super cool giveaway for our readers from Onanoff, so make sure you scroll down. When I started looking around for headphones I began by Googling "best kid headphones." The number of types and styles of headphones were overwhelming. There were cutesy ones with animals on them and ear bud ones and just thin ones that looked easy to stow away. We bought a few different pairs and they were rarely worn, especially the cutesy animal ones. Instead they were used for pretend play activities where the animals came to life and got dragged around our house. Ha! When our BuddyPhones arrived at the house my 3-year-old daughter was immediately intrigued. She said, "Can I put those on right now?" Once we opened the box, we discovered the headset and 5 sets of stickers that could be used to personalize the headsets. Since it was close to the 4th of July my daughter decided to go with the stars and stripes stickers. She thought it was really neat that she got to pick what was on the headphones. I loved that she could put the headphones on all by herself since that hasn't been the case with some of the other sets that we've purchased. The BuddyPhones also fit her head, rested comfortably over her ears, and were easy to set up! The pads that went over her ears looked way more comfortable than the other sets that we have. Once she got settled in watching a show I realized that the headphone jack had a splitter so that TWO headphones could be used at a time. Genius!! Often my two oldest are sharing headphones and have to each wear an ear bud... or we are rummaging around trying to find a splitter. I loved that this set had one built in! I was a bit skeptical about BuddyPhones to begin with, since they are pretty new and I hadn't heard about them very much. I was totally excited to try them out and share my thoughts with you. A built-in splitter that allows you to share your music and works for any standard 3.5mm headphone jack, so I could use my headphones in the jack and watch a show with my child. My only two complaints with the BuddyPhones is that they aren't offered with black ear pads and they only have two colors so far (pink and blue). I have a feeling with my kiddos the white pads are going to get dirty quickly! Today I am really excited that Onanoff is going to give away a set of BuddyPhones to one of our awesome Toddler Approved readers! 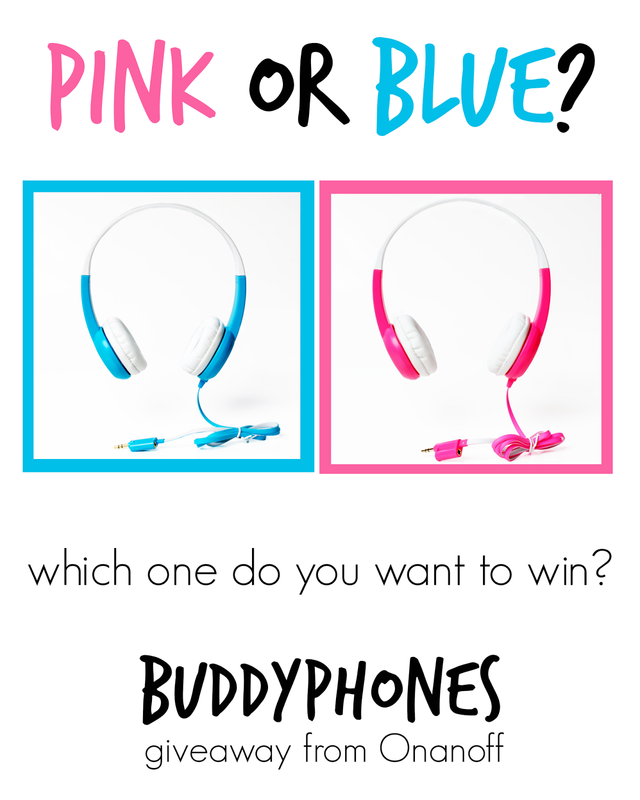 Our BuddyPhones winner can choose either pink or blue headphones (This giveaway is for US residents only). If you'd like to keep up with other giveaways, deals, and exciting news from BuddyPhones, you can follow along with Onanoff on Facebook, Twitter, Pinterest, and Instagram. You can get up to six entries by completing all tasks mentioned in the rafflecopter form below. Some earn you more entries than others. The winning entry will be drawn on Thursday, July 24th. I will notify the winner via email. This post is sponsored by Onanoff. I was compensated for the time and effort I spent to review the product and host a giveaway. Payment does not guarantee a positive review. All opinions in this post are mine. I want blue! I wish they came in more colors though! Blue please! I'd love these for my 3 yo son. It would be great to put a movie on without bothering his brother while he's napping! Blue please! I'd love these for my 3 yo son! This would be so amazing for my boys!!!!! Thanks for the great giveaway! The kid headphone struggle is real in our house with my 4 year old. I'd love to try these! I think she would choose blue! I really like the shade of blue too! I would like blue. Thanks. These are great. I would love a blue pair! This post has been really helpful. I have been looking for some headphones for my 4 year old son and these look great. I love that he will be able to customize them and that there is a cap on the volume. I bet you could easily wipe off the white ear pads. I think if I win I'd like blue. Love the blue ones! And the built in splitter. That's genius! I would absolutely LOVE a blue pair!! My daughter & son would get a lot of use out of these!! I've been looking for some just like this! For my two munchkins who are destructive as well! Oh, I don't care about color! My kiddos like both! Thanks! I can't tell whether it published my comment... my son would love to have a blue pair. Thanks again for the giveaway! I would pick pink for my 3 and 5 year old!! I'm not sure if my comment was posted, but if not. I would like the blue ones for my son. I would love the pink ones for my girls! What a great product, we listen to hours of Adventures In Odyssey and headphones are always being used around here by someone. Love the "extras" this one provides! We would choose blue if we won. Looks like my other comment didn't register. Either color would be awesome!! Would love to have these for my girls to use on car trips to Grandma's house! Blue! My son would love these!! I think the blue pair is super cute! I think the blue set is super cute! Those look great! Pink please. Pink would be the winner at our house! Pink please! Great for my daughter 'cause we are often in a plane. Pink please! These would be perfect to keep my daughter occupied as she needs to come to one of my 3 hour lectures every week. That's to funny! When my daughter was 2 my dad kept her for a night and she wouldn't sleep well so they stayed up all night watching the Three Stooges and she loved it! We would pick the pink ones! My almost 2-year-old son would love the blue headphones! Thank you for sharing the wonderful product information and it's review. Appreciate the time that you take and the knowledge that you share. We've got boys and girls so either color is fine. I want the pink for my daughter now, but will need a blue pair for my baby boy in a year or so! pink for my little girls! 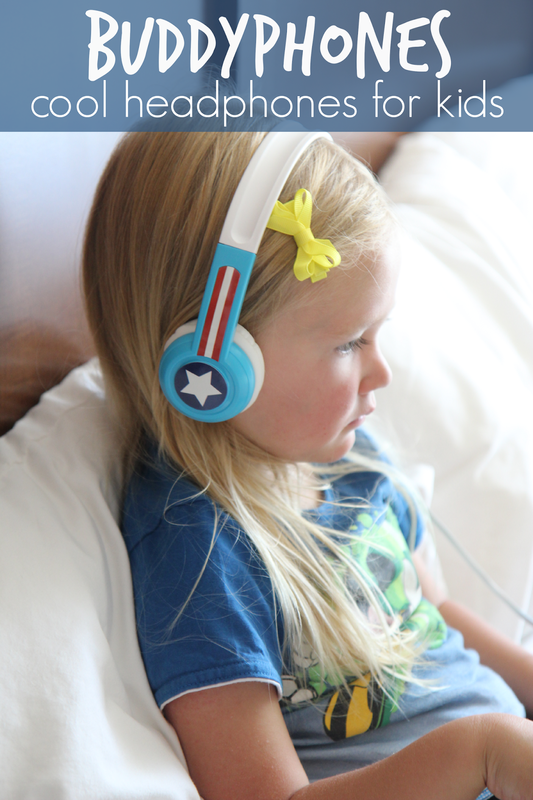 Kid headphones are on our to-get list so this is perfect timing:) And currently, my daughter also watches videos without sound on airplanes - just waiting to see when she'll get sick of that. I would love the blue ones for my grandson! Thank you. I have twin girls who LOVE music and games. I would love to have these!! These would work great for my classroom! Blue would be my color choice. Thanks for the chance to win! I would go blue. Love that these are volume limiting to prevent hearing loss! These would be wonderful for my son! he loves music and I haven't been able to find headphones I like for his individual listening! Blue for my Boy! 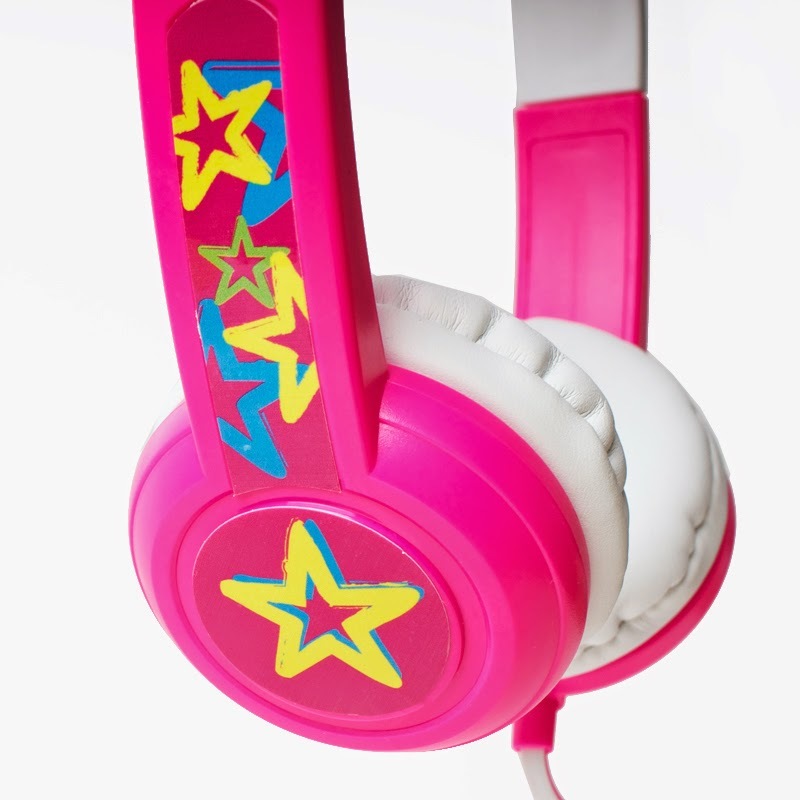 Me sweetie Brynn would love either of these cute headphones, but PINK is definitely her favorite! Blue for my lil man!! Blue would be great for my son!!! I would love to win a blue set for use at my listening center in my kindergarten classroom. I'd love the blue ones for my son! Blue is always the color to choose! Thanks! My 11/2 yr old would love these! Blue please!! Pink for my little gurl!, please! Blue please... my little dude loves to copy Mum and Dad. He would look cool in these. They also look very safe and sturdy! Blue would be great! My little one would love these! My 3 year old would prefer blue please! I'd like the blue ones if I were to win. Thanks for a great giveaway!